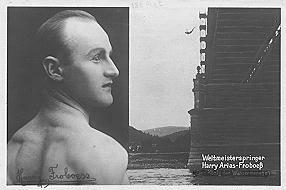 One of the pioneers of stunts was the German Harry Arias Froboess - born 1899 in Bern/Switzerland (or Dresden/Germany - there are different sources) - who was already doubling for many stars in the silent movie area. Because of his hereditary "handicap" - his mother taught him to be a jumping fish, his father preferred to teach him gymnastics - he was predestined for the new genre. 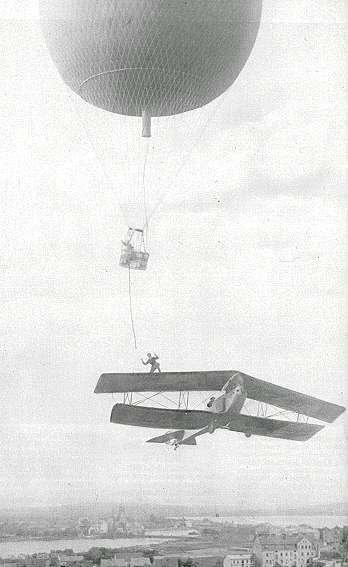 He jumped from higher and higher bridges and towers into water which finally culminated in a leap from a zeppelin from a height of 110m into the Bodensee. This leap is still unrivalled and is in the Guiness book of records. It is assumed that this jumped didn't happen in reality but it should be a clever PR gag. Even on his 70th birthday he insisted on jumping from a helicopter (at a height of 40m) into the lake of Zurich. At the beginning of the movies everyone had been engaged as a stuntman, surviving however was private a matter, and quite a few had paid for their recklessness with their life. Froboess avoided by going through all security precautions and trying to assess all possible risks. His great breakthrough in the film business came with the Harry-Hill movies. In these movies he climbed from a train traveling at breakneck speed into an airplane, finally pulling himself up into a shackle balloon. In another movie he threw himself down from a 60m high bridge together with a horse and this stunt was called the "greatest movie sensation of the world". By the way this scene happened in the movie "Harry Hills Jagd auf den Tod" (1924). These headlines opened the gates to Hollywood for him. Shortly afterwards he stood in for the greatest stars in their most dangerous situations. For Stan Laurel he hung on a clothesline at a dizzy height, for Harold Lloyd he "raged" on flagpoles on a highrise, for Buster Keaton he jumped from facade to facade. In his long career he exploited his skills for Marilyn Monroe and Robert Mitchum (River with No Return), Bette Davis (The Bride came COD), Marlene Dietrich (Destry Rides Again), Greta Garbo (Queen Christina), Burt Lancaster (40 Wagons West), Richard Widmark (Alamo), Errol Flynn (in the pirate movies) and Humphrey Bogart. But his individual statements about his activity have to be taken with a pinch of salt. As a streetwise entertainer embellishments of the reality belonged to his life. Today not all stunts can be proved for sure. Altogether Harry Froboess took part in over 400 movies - there is hardly a day when there isn't a movie shown in which Froboess played. 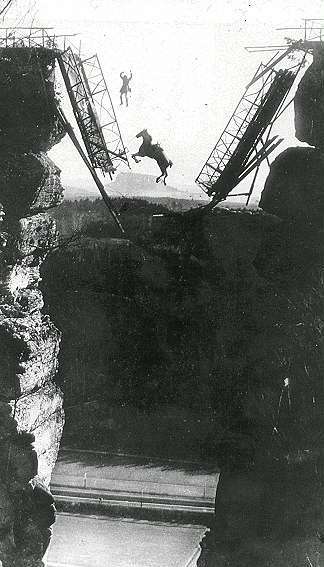 Later - when he had long been retired - and saw scenes from an old Western, where he jumped over a gorge with a horse as Zorro it made him shudder still. "Because I trained from childhood, it was not at all so dangerous. I always knew the risks but this required training and enormous body mastery. When you prepare a stunt, you hardly have a chance to think of fear, all your energy goes into careful preparation - and while doing it you don't have time for it, this would only divert your concentration. Precision and caution are the most important qualities of a stuntman". In 1985 Harry Arias Froboess died at the age of 86. As a stuntman he remained nameless but in film history and above all in the world of stunts he carved himself a permanent place.